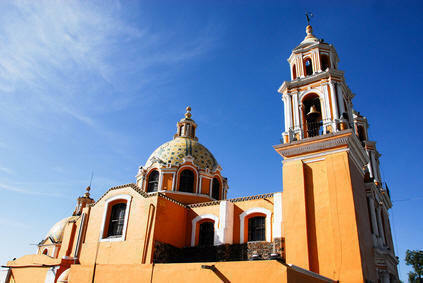 At the foot of the legendary Popocatépetl and Iztaccíhuatl volcanoes is the majestic, peaceful city of Puebla. They say that Puebla, a lovely colonial city, was entrusted to the angels when it was founded, and this is the source of its name: Puebla of the Angels. Those of us who live in Mexico City are privileged to be near to Puebla, just an hour and a half away by a modern highway. On May fifth, 1862, Puebla was the scene of one of the historical events that fill Mexicans with pride: the victory of our army over the French army, which was the biggest in the world at the time. This success would not have been achieved without the heroic participation of the Zacapoazxtlas, the courageous natives of the region, who joined with the young General Ignacio Zaragoza, appointed by President Benito Juárez to defend the land from the French invasion. Without knowing military strategy, they armed themselves with sticks and machetes, and overcame the French, ennobling the name of Mexico. From that year on, their feat has been commemorated on the 5th of May every year. Taking advantage of the fact that another anniversary of this very important event was approaching, we had the opportunity to spend a marvelous weekend in Puebla. When we arrived, we went directly to where the famous battle took place: the Loreto and Guadalupe forts. They are half-destroyed constructions now, but the idea of being at the exact place where an event of such importance for our country was most exciting. After staying there a while, we decided to wander about Puebla, appreciating the avenues and the colonial buildings, which are the best representation of colonial Mexico. We went downtown. There we saw the typical town square or “zócalo“, with its bandstand, fountains and doves that fluttered all around. To one side, the great cathedral, the loveliest that the Spaniards built in Mexico.